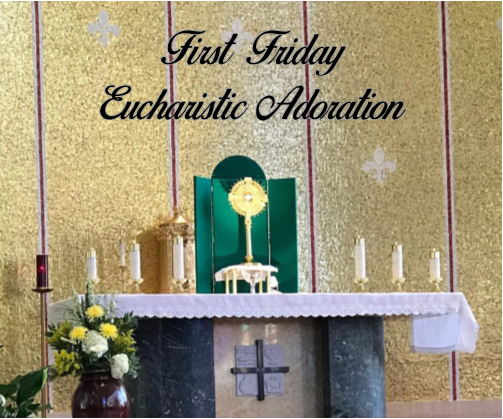 First Friday Eucharistic Adoration takes place the first Friday of each month immediately following the 9:00 am Mass with Exposition of the Blessed Sacrament. Evening prayer and prayer for the sick is held at 7:00 pm, followed then by Benediction. If you would like to have your name mentioned in the healing prayers, please notify the parish office by Thursday, the day before. Please also be sure to keep us updated each month if you would like your name to remain on the list. All parishioners are encouraged to come for an hour of adoration so that our Eucharistic Lord is attended throughout the day. If you would like to be a regular Adorer or a substitute, please call John at (717) 533-9529.